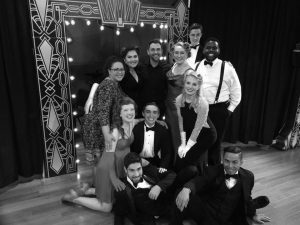 On Friday, March 24, members of the Rollins and Winter Park communities took their seats for the opening night of Crazy For You: A Gershwin Musical Revue, directed by Dr. Marisa Arzillo. After the band warmed up, the show began promptly at 7:30 p.m in Rollins’ own Tiedtke Concert Hall. Instead of performing the entire Broadway show, the music department was given exclusive approval to perform a revue of only the songs. This new take on the 90s musical was refreshing, and brought attention to the wide range of music offered in the show. The song preceding the finale, “The Real American Folksong,” was originally written in 1918. Several compositions debuted in the 1930s. Conducted by Professor Jamey Ray, the band seamlessly transitioned the show from one song to the next. This, combined with the acting between scenes, made it easy to forget that the dialogue was ever taken out. The revue stayed true to the original’s promise for comedy, eliciting laughter from the audience several times throughout the show. This made the ballads about heartbreak even more forlorn. The set was simple; a few black pillars held up a black curtain, mostly covering the band and any cast members waiting for their turn to perform. The pillars’ gold trim and lights evoked the nighttime class of the 1920s and 30s, while staying simple enough to showcase the performers onstage, twelve in all. Two stools were the only props needed. The female entertainers almost seemed to become a part of the décor as they danced and sang in sparkling evening dresses, each with her own color, pattern of glitter or rhinestones, pair of gloves, and early-twentieth-century hairdo. The men wore black suits, distinguishing themselves with a black bowtie or neck tie, some adding a cummerbund. The dance steps were terrifically executed by everyone in the cast, a tricky task to accomplish. The choreographer, Wendee Engle, Artistic Director and Head Choreographer of the FCA Integrity Dance Program, was a true asset to the show. The singing was also extremely well performed; the entertainers did not need microphones to project and hit high notes with grace. “The singing was wonderful,” commented Rene Borr ’18 after the show. Surprisingly, for the song “Slap that Bass,” bassist Pat Gallo came out from behind the curtain to solo and be included in the performance, an enjoyable artistic choice.